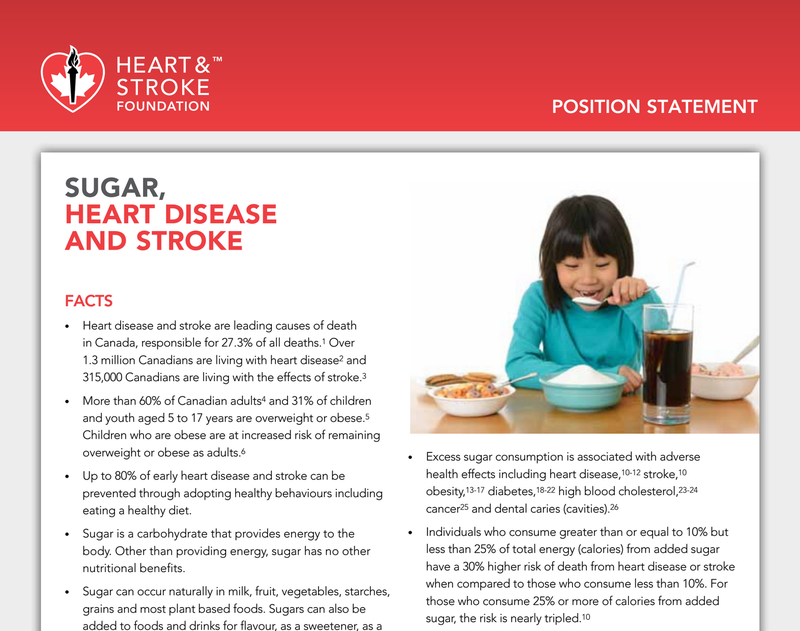 Weighty Matters: Canada's Heart and Stroke Foundation Issues World Leading Sugar Statement! 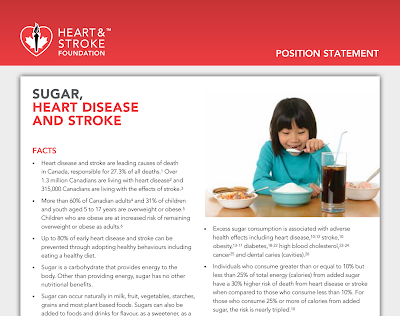 Canada's Heart and Stroke Foundation Issues World Leading Sugar Statement! Huge kudos to Canada's Heart and Stroke Foundation. For years I've pointed out that public-private partnerships with the food industry necessitate watered down public health messages so as not to offend the industry partner's products or positions. With this in mind, my hope had been that in unchaining themselves from their food and restaurant industry partnered Health Check program, Canada's Heart and Stroke Foundation (HSF) would suddenly be free to take on a leadership role in the area of food and public health - and if today's news is any measure, the HSF is doing just that and is positioning itself to be Canada's voice of dietary reason, and a world leader in health charity driven public health advocacy. Today's news has to do with their release of their new position statement, "Sugar, Heart Disease and Stroke", which is as hard hitting as any I've read, and runs in line with the World Health Organization's recommendation to limit added sugars to between 5-10% of daily calories. I vastly prefer the HSF's use here of the term "free sugar" rather than "added sugar", as free also covers sugars freed from their fruity origins and would include juices and products made with juice/fruit concentrates and purees. Taxing sugar sweetened beverages and using funds generated therein to subsidize fruits and vegetables. Adopting a Bloomberg style large cup ban (if you want to drink a litre of Coke, you'll still be able to, you'll just need to buy two cups)! Banning the practice of junk food fundraising. The only thing missing from these recommendations (though it's certainly implied), is a direct call to action for the overhaul of Canada's 2007 Food Guide and with it the Guide's inclusion of free sugar limits, and the removal of the Guide's inane recommendation that half a cup of sugar water with vitamins (juice) is a fruit serving equivalent. Whether or not you agree with the HSF's recommendations, one thing's incredibly clear, the HSF is no longer the food industry's partner - and that news is tremendous for Canadians as it's amazing how forceful and broad-sweeping public health organizations' recommendations can be when there's no worry about upsetting industry partners.